Professional. All communications were easy to follow. It was the perfect spot to get away and relax. Easy drive to Grand Marais. Had everything we needed. Comfortable and homey. 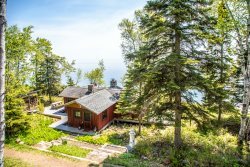 Cozy little house in town with a great deck and easy walking distance to everything Grand Marais has to offer. Great location, eating options close by. We were overall pleased with our stay. Convenient location, close to eating options. I have rented several properties through Cascade Rentals and I have been pleased with all of them. Instructions are clear and the properties I have rented have been as described, nicely furnished and clean. We enjoyed our stay at Terrace Point, 11A, so much that we have already booked it for our annual fall color trip next year. Fantastic! I have a bad hip so we were supposed to be on 2nd floor but without an elevator in the property it may have been difficult for me to do so many stairs every day. The staff switched our room to the main floor for us. It was very much appreciated! The inn had everything we needed. The room was clean and we had plenty of room. Convenient to everywhere we wanted to go for about half the price of resorts in the area. We definitely will be repeat customers. A nice, quiet place to stay . Close to ski lodge and convenient to other sites. They are professional managers and well organized. The perfect stay in Grand Marais....very central location and nice unit.